I've been receiving requests for Filipino Style Macaroni Salad...so here it is! 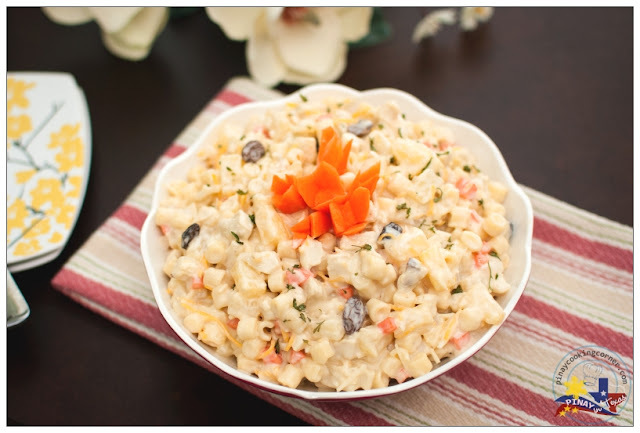 Unlike the usual macaroni salad which is served as a side dish, Macaroni Salad in the Philippines is mildly sweet and is served as dessert especially during parties and special gatherings. Just like any other Filipino food, it varies from region to region...but there are three characteristics that remain consistent: it's creamy, a little sweet and a little sour and it has three basic ingredients: macaroni, mayonnaise and chicken. 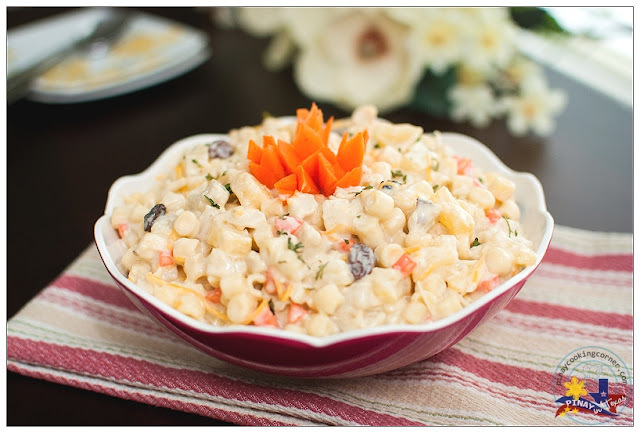 This Filipino Style Macaroni Salad that I am sharing with you is my mom's version. I grew up with this very simple but really delicious macaroni salad which for me has a well-balanced creaminess, sweetness and sourness. For me, this is the perfect one! The combination of ingredients is just right and doesn't overpower the supposedly main star of the dish which is the macaroni! 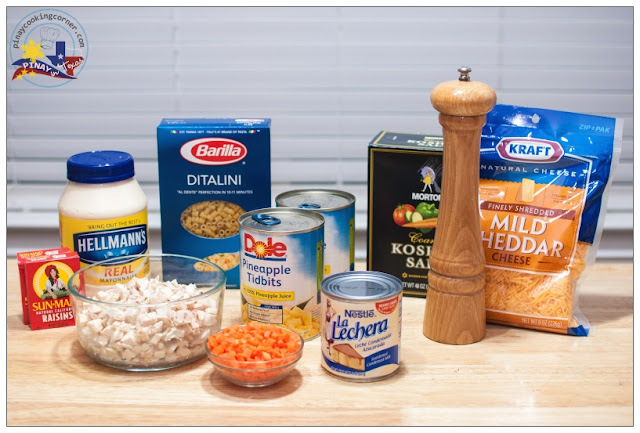 My mom has always used the "Royal" brand salad macaroni which is about 1/3 the size of elbow macaroni, and I find that more ideal for Macaroni Salad. But I can't find it here so I used another kind of tube pasta by Barilla which is called Ditalini. 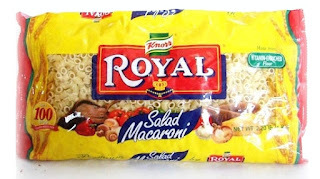 It's a bit smaller compared to Royal salad macaroni but it works well. If elbow macaroni is all you have, you can just use that too! 1. Cook macaroni pasta al dente (in water where you boiled the chicken) according to package instructions. Drain then set aside. 2. In a large bowl, mix all ingredients (except the onions) until well combined. If you don't think you can finish the whole serving in one sitting, divide it and mix the onions only to the portion that would be served. I love pasta salad, your version of traditional touch I love it Tina. Oh yes, the good old Filipino style macaroni salad with pineapple. Next to the fruit salad, I always went for this when I was growing up because it's so good. And I end up not able to eat the main dish and then I get in trouble with my mom. Well, thank you for these wonderful recipes you have been sharing with us, Tina. It's always been a pleasure to read your blogs and posts. Take care. 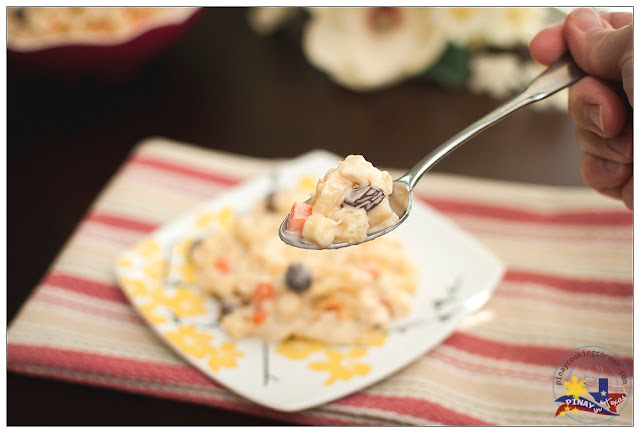 I love these types of macaroni salad! This one looks very refreshing! Hi!I was probably one of the people who requested and I immediately made it. Even my son who claims he doesn't like mayo nor raisins had some and loved it! Thanks for another delicious recipe! I'm going to try this now. This looks delicious! I will make this! Thanksss for sharing your recipes.. I tried your recipe because it included condensed milk which is different from the others. It truly made a difference. I only altered the cheese with Kraft canned cheese. Overall, your the recipe is perfect and is now my go to recipe. I've been looking desperately for a really good authentic chicken macaroni salad tonight, and this one looks absolutely delicious! Better go and start making it for my party tomorrow, thanks heaps for sharing this lovely recipe. Thank you very much for sharing this recipe. It's perfect. Everybody loved it.